"at a glance, in advance" weather alerts and notifications. 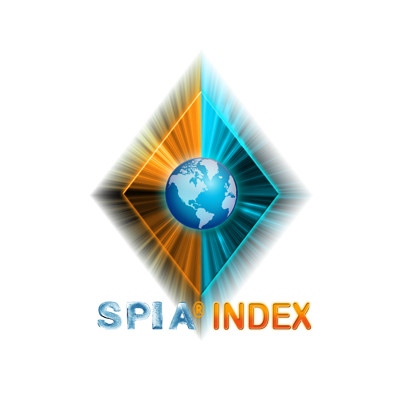 The SPIA Index is a copyright product with controlled distribution. This product is being offered free-of charge for the current 24-hour forecast window. For 72-hour forecast services, a subscriber login is required. Click here for more information on the available National Outages/SPIA tiered services. 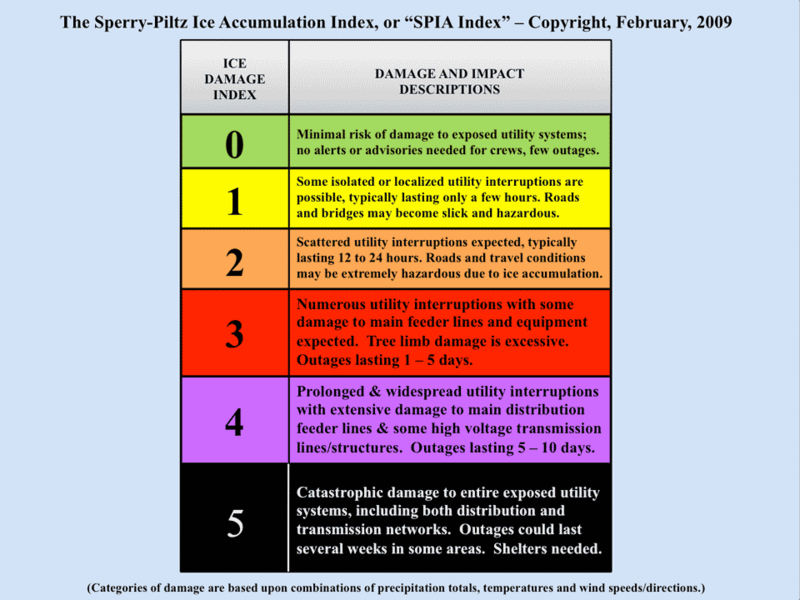 What is the Sperry-Piltz Ice Accumulation Index? 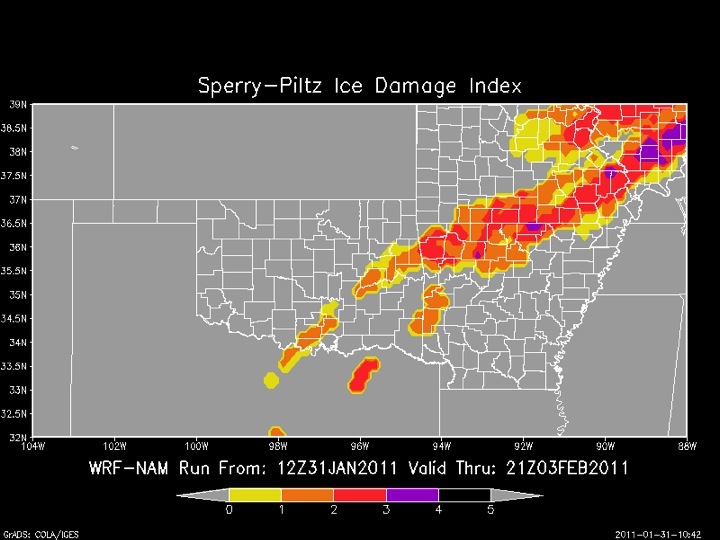 The Sperry–Piltz Ice Accumulation Index, or SPIA Index , is a forward-looking, ice accumulation and ice damage prediction index that uses an algorithm of researched parameters that, when combined with National Weather Service forecast data, predicts the projected footprint, total ice accumulation, and resulting potential damage from approaching ice storms. It is a tool to be used for risk management and/or winter weather preparedness. The SPIA Index  is to ice storms what the Enhanced Fujita Scale is to tornadoes, and what the Saffir–Simpson Scale is to hurricanes. Previous to this hazard scale development, no such ‘forward-looking’ ice accumulation and ice damage index had ever been utilized to predict – days in advance – the potential damage to overhead utility systems, along with outage duration possibilities, from freezing rain and/or ice storm events. These parameters, when used in conjunction with digital forecasts from local NWS Weather Forecast Offices (WFOs), have been shown to accurately predict the duration, intensity and damage capability of ice storms. The exclusive distributor of the SPIA Index for alert/warning markets. Please contact SPIDI or National Outages for how you can be notified if/when ice damage is forecast in your area.